This is a great quilt for a beginner who wants to tackle something big…and a good way to use a fat quarter bundle that’s collecting dust (wouldn’t we all love that problem?!). * The blocks are all 8″ finished (8 1/2″ unfinished). * Each fat quarter will make 4 + 1/3 blocks. Each 1/4 yard will make 4 + 1/4 blocks. So if you know the number of blocks you want…divide that by 4.3 or 4.25, and that’s how many fat quarters or 1/4 yards you’ll need. * The table below is a guideline…measure your mattress to make sure what size you’ll need. Remember that a large quilt can shrink as much as 4″ in each direction depending on the batting. 1. 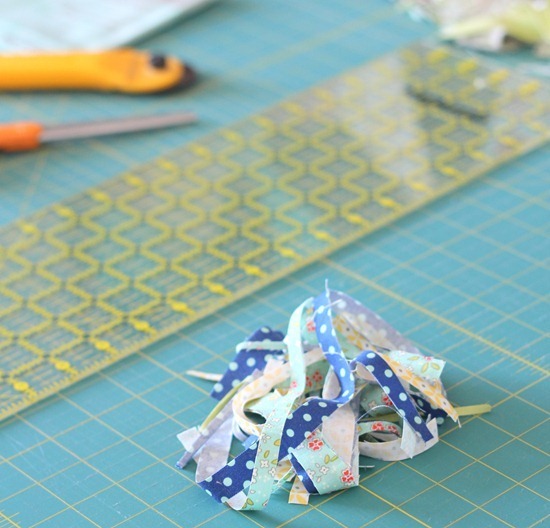 If you’re using fat quarters… download and print the cutting diagrams HERE. If you’re using 1/4 yards…download and print the cutting diagrams HERE. 2. 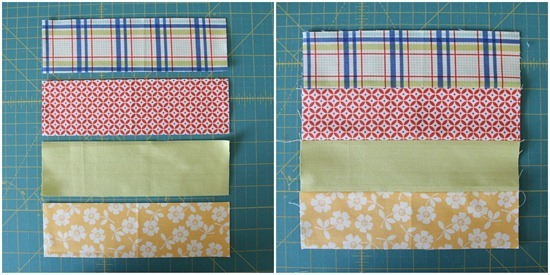 Choose a 4 1/2″ square and sew a 2 1/2″ x 4 1/2″ strip from a different fabric onto each side of the square. Press out. Repeat with a 2 1/2″ x 8 1/2″ strip on the top and bottom. Press out. Repeat until all of these pieces are gone. 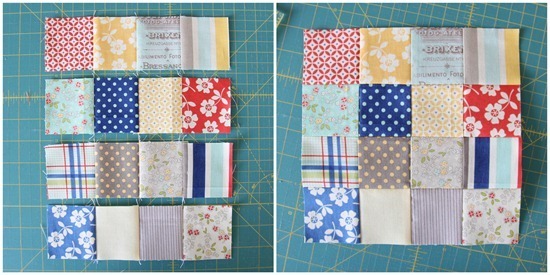 You’ll have 1 of these blocks for each fat quarter or 1/4 yard you cut. 3. Sew the remaining 2 1/2″ x 8 1/2″ strips into sets of 4 until they are gone. I like to press my seams open. 4. 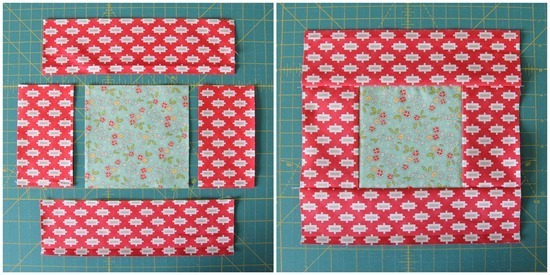 Sew the 2 1/2″ squares together into 16 patch blocks. Sew the squares into rows of 4 first and press, alternating the pressing direction for each row (or press seams open). Sew the rows together to make a block and repeat until the squares are gone. There aren’t many of these blocks…but if you want more variety in your quilt you can always make some more with scrap squares! 5. The rest of your blocks will be your plain 8 1/2″ squares. 6. Sew the blocks into rows and press, alternating pressing directions with each row. Sew the rows together and press. * When sewing together a large quilt like this, I sew the blocks together into sections. I layout and sew one quadrant at a time, then sew the 4 quadrants together to make the large quilt top. It’s like making 4 mini quilts and sewing them together to make the large quilt…and its much easier to handle under my sewing machine. * My fabric is Seaside by Riley Blake Designs, and Vintage Modern (the red, green, and grey rectangles) by Moda. 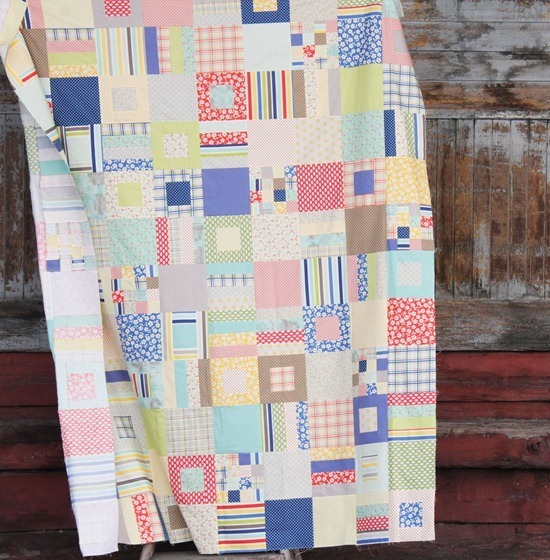 Which is why I called it my Seaside quilt for those of you that asked…no one said I was good at naming quilts! Well what you may lack in naming quilts (not saying that you do BTW!) you certainly make up for in designing them, this is gorgeous (and I like the name, it suits it!). thank you for the tutorial ! i like this quilt very much ! First of all absolutely love this quilt. Congratulations!! Oh Thank you so much. Now I know what to buy. (I have many fat quarter bundles i need to use, older lines) You are a super person you know! Thank you Alison and I love Seaside and your creative quilts!!! What a very fun quilt…Love it! Thank you for sharing it with us! Wow thanks for such an easy but fun quilt design. I did download the cutting directions for FQs as I need to use some of mine. (it seems I prefer to "save" them) LOL. Maybe I can whip up one of these beauties from some of them. I have a Halloween themed FQ bundle that I adore, but I had not found the right use for them until now. Thank you so much. I love this quilt! Thanks for posting the directions!!! I love it! Especially all of the size variations! Would this work well with fat 1/8ths too? I have a bunch of those lying around. If not could you shoot me some other ideas that might? Thanks so much! This is beautiful. I can't say thank you enough for the hard work you've put into this tutorial. I'm sure I speak for many quilters when I say how much you are appreciated. Thank you. I am so glad that you made a tutorial for this quilt. I loved this quilt when you posted a picture of it. Thanks so much. I love every single quilt you design! Your style is amazing, I own several of your patterns, plus I've made your zig zag quilt, your double hourglass,the disappearing 9 patch, your kaleiscope,the shortcake and the bizzy kid (3 times now). Now I WILL be making the seaside!! Seriously, I LOVE you STUFF!! Thank you for your amazing patterns and tutorials! Thank you for the directions. I had to write down your stuff as I don't have my printer with me but well worth the time. I can't wait to make it. Thanks for the freebie!! Printing it out now to add to my ever growing "to do" list. Some of the blocks are Striped fabrics….so they look like strip blocks but are just Stripes. I placed some of my strip blocks next to each other to add some interest to make long sections of strips! I ADORE this. Bookmarking it, for sure. In fact, I'm teaching a friend how to quilt this summer, and we might just have to use this tutorial! This is great – so sweet and homey! Thanks for the tute! You are such a sweetie for giving us this tutorial! It's a fabulous quilt and is now on my to-do list! Thank you for the tutorial…this looks fun! I've had a set of fat quarters collecting dust for, oh, 6 years? It might just get cut into! So I saw the quilt. Thought, "I'd like to do that one"
Gorgeous just love it. Thanks so much. Thank you lovely lady for this wonderful tutorial. It was so kind of you to share w/ great pictures & explanations….& all for free! You & your blog are greatly appreciated by me! Thank you for the tutorial, this is just what I was lookin for to get started on my first quilt! Allison, I too, am loving your quilt and your hard work on the tutorial…..thank you soooo much! You mentioned about the shrinkage of quilts….."depending on the batting"..
A 100% Cotton batting will shrink more than a 80/20 or polyester batting…it usually says on the package how much shrinkage to expect. Great quilt design. I really like the lack of scraps left over! Once again thank you so very much for sharing your expertise with us! I learn so much from you!! Love everything about this Allison! this is fabulous and i really appreciate the tutorial! thank you so much!! Thank you so much for sharing this turorial!! Great to use all scraps of fabric!! Nothing goes to waste!! Stunning!!! If only I could quilt… :) Blessings! I love all of your quilts and have purchased some of your patterns. Thanks for this one. Question: When I click on the cutting layout links it takes me to the Google Drive homepage and not to a specific file. Can you help? Thanks! What a beautiful quilt top! Thank you so much for the tutorial. I can't wait to make one for myself. I love that red floral print! 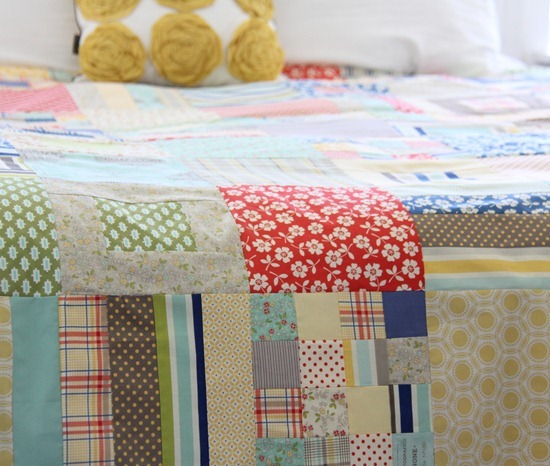 A-totally love this quilt…it is a cheery, breezy summer quilt, perfect name for it as well! This isn't a tutorial, it's a free Cluck Cluck Sew pattern! So generous of you to share it with us. I love that you provide size options. I know it takes more time and effort, so pls know how appreciated it is! Thank you so much for this, I love this quilt sooo much. Have you quilted this one? I made 2 (crib-sized or so) and I can't decide how to quilt them. This is wonderful. but your cutting instruction links no longer work. :( I would love to get get them since I have several fat quarter bundles awaiting an adventure. I am trying to get the cutting instructions – but the links aren't working. Can you help me – I was really excited about making this quilt. Thanks for this tutorial! I'm working on a quilt from it right now. 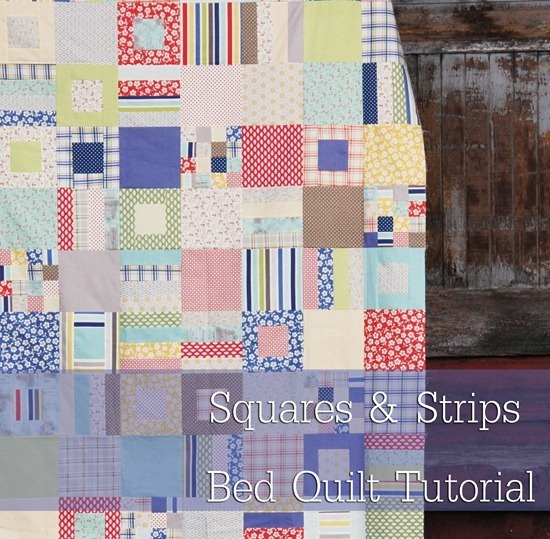 I love this quilt and the tutorial. Making this as a Linus project Friday, at FatQuarters quilt shop in Vista, California. Thank you for the great directions. You have me inspired! Thanks for sharing. Gosh! It's fab….but you're 2 days too late!!!!!!! I sat up for hours the other night working out how many blocks I would get out of my Seaside bundle to make the pinwheel quilt from Moda Bakeshop into a larger throw for my caravan!!! If only I'd curbed the enthusiasm and waited! Thanks for sharing it's great for novices like me! Beautiful! and perfect for those fat quarter bundles I've got hanging around! Thank you very much! Beautiful quilt. Thanks for the tutorial. I am excited to use it for a fat quarter bundle I have had around for a long time. It's perfect! 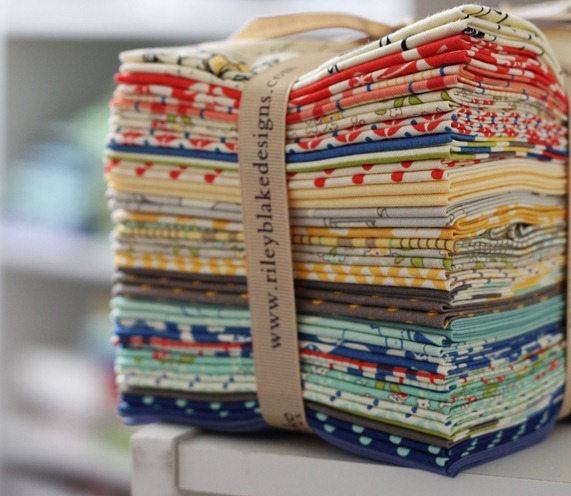 I'm making this quilt at the moment – what did you choose for the binding? the photos on the blog show it unbound. I'm scratching my head over what to choose from the different seaside fabrics. I would have gone for one of the darker blues but I have the pale turquoise flower print for my backing. I'm so excited to begin this quilt for my son's new bed! I'm using Riley Blake's One for the Boys but only chose 5 of the prints from the collection. I'll probably sprinkle in one or two coordinating solids but should I try to use more than 7 prints or would that be enough? Thanks for the tutorial. I can't wait to get started! Lynn I think you'd be fine with 7 prints if you mix in solids that match…if you don't it might be tricky to layout blocks without the same fabrics touching! I absolutely love this quilt. Do you think that 40 fat eights would be enough to make this quilt? Hi Emily! It should work…it might just take some figuring out on the cutting diagrams to make it work! I was just wondering how many different colours you used for this quilt? I know that I need 32 1/4 yards but I feel like 32 different colours could be a little chaotic! 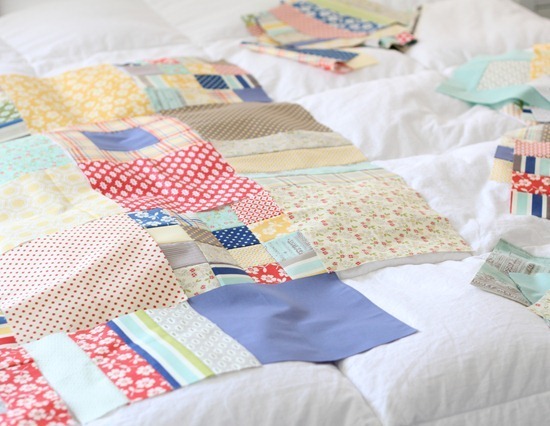 I'm using scraps and wanted to know how many of each style block would I need for a queen sized quilt, can you help me? I have a lot of Kanvas Cabana II nautical fabric and I've been letting them stew until I found the right pattern for them. This is it! I make Quilts of Valor almost exclusively and it will be going to someone in the Navy or Marines. I'm just going to put a border on the throw size to make it a little bigger. Thank you! This quilt is so beyond beautiful. I have never made one so amazing in my life. Thank you so so so much. Thank you so much for your beautiful site. I love your work and I wanted to start making my first full sized quilt by learning a new square a week. You have really helped me by helping me start by work out the materials I need. Thank you for being so generous in sharing for free. What an inspiration you are. I love this! Is there any way I can get a copy of the pattern for 1/4 yards? It’s not letting me download it.